What kind of product guarantees do you have? As we have no control over soil, weather, planting or maintenance conditions after plants leave our nursery, we will not replace plants that fail to live or thrive. Trees installed by one of our registered contractors usually includes a 1 year warranty. Do you have a sales yard? We have a very large selection of the items mentioned in our catalog that are on the ground ready to purchase. Our stock is kept healthy and vigorous thanks in part to our efficient drip irrigation system. We ask that you please accompany your clients during the selection and pickup of plant material. Deliveries are available. Please call for schedule and prices. What kind of burlap wrap do you use? All orders dug from the field are placed in regular burlap. Due to increasing cost of material, any orders requesting treated burlap will include an additional charge. Do you use wire baskets? 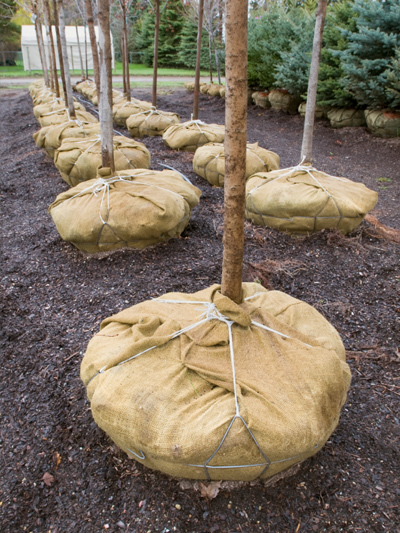 Our trees and upright evergreens are placed in vermeer dug 21", 24", 28" or 32" wire baskets.